When I began this report on Magdalena Bay, it became apparent that one article would not be enough to cover the esteros and all their secrets. Many anglers have experienced the almost unbelievable offshore fishery, specifically for billfish, but only a few have taken the time to explore the bay and its esteros. This will give you some insight into the mysterious esteros. Years ago, only a few of the yachts and sport fishers traveling south to Cabo San Lucas, or on their return trip home, carried enough fuel without replenishing their tanks in San Carlos. Traveling eastward, they followed a difficult-to-navigate, dogleg channel requiring both patience and skill. If their chart wasn’t marked, it was “all hands on deck” to spot the small channel markers. Now, with GPS and a better-marked path, it’s much easier, although the 19-mile journey can still be a harrowing experience for the first-timer. The same can be said about tying up to the pier. Trying to figure out where to dock can be daunting among the collection of small freighters, tuna seiners, bait boats and sport fishers. Usually, the dockworkers and API employees will direct incoming vessels and provide directions for purchasing fuel and other supplies. Departing from Puerto San Carlos, north of the deep-water dogleg channel out toward the entrance, are the sandy beaches (called Los Burros) on Isla Magdalena that form a barrier to Santa Maria Bay before Magdalena City where small halibut, sierra and corvina often lurk. Further down the channel toward the entrada to Punta Belcher, anglers will find a good overnight anchorage and a great spot to replenish the bait tank with mackerel before venturing offshore. Beyond Belchers, the terrain becomes rockier. There are spotted bay bass, grouper, pargo, corvina and perhaps a white seabass along the shore all the way to the south end of the island. Across the entrada to the south, along the lee of Isla Santa Margarita, you can expect similar action around the rock structure. In the entrada, watch for birds diving on schools of bait that are being chased by yellowtail, sierra, bonito, corvina and white seabass. The expansive bay itself offers more fishing along the shore than in the middle where the whales frolic from late December to March. 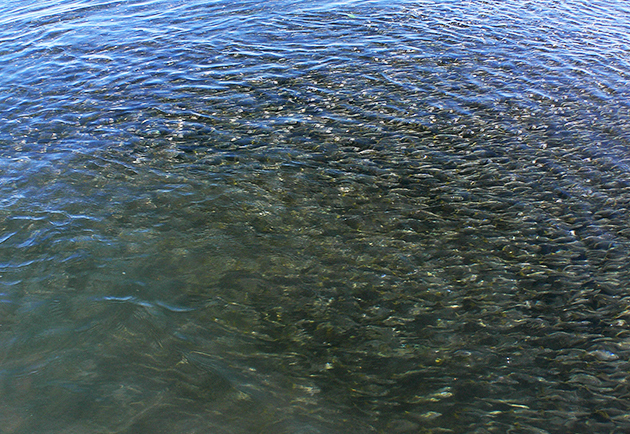 Outside the entrada, it is not uncommon to find skipjack and small yellowfin tuna slashing through the bait balls. Early morning or late afternoons, try just inside the northern side of the entrada past Sail Rock. Often the corvina and white seabass will stack up on the rock shelves and bite just at sunset. 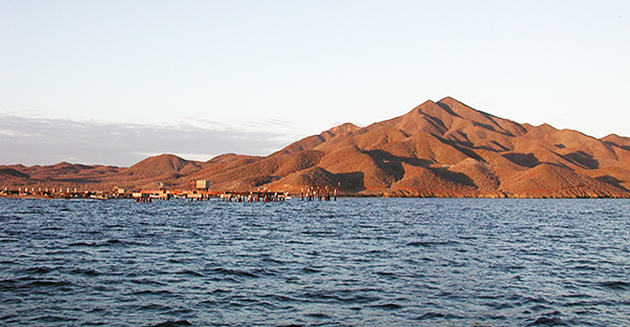 Puerto San Carlos is the epicenter of Magdalena Bay, both geographically and in terms of size, with nearly 6,000 inhabitants. More services are offered here than in any other village on the bay, including hotels, motels, markets and a few restaurants. If you fly into either Loreto or La Paz, the driving time is about three hours. The turnoff for Puerto San Carlos is on Mexico 1 at the north end of Ciudad Constitucion. 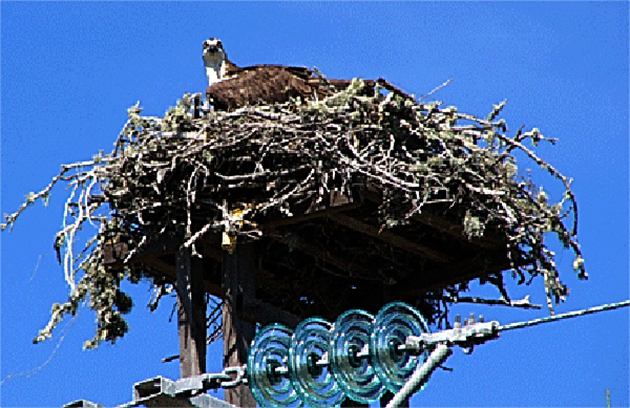 The 35-mile paved road heads west through a colorful cactus-strewn desert with many of the electrical power poles topped with osprey nests. For private aircraft, Ciudad Constitución Airport is one mile east of the central business district with a paved 5,250-foot runway. There is also a dirt strip available at Lopez Mateos. 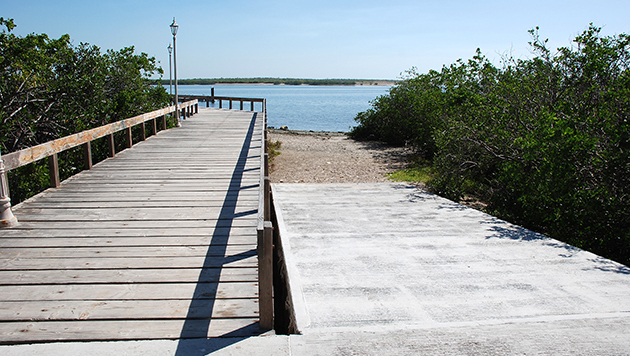 The center of activity for the town of Puerto San Carlos is the pier with deep-water access. Large ships come and go, loading and offloading cargo. You only have to look beneath the pier to get some idea of the abundance of sea life in the bay. Sardines, mackerel and game fish are sometimes so thick you cannot see the bottom. 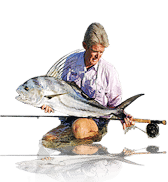 This is your gateway to both the esteros and offshore fishing – the likes of which are hard to find anywhere else in the world. While there are a few places that you can access on foot, your best bet is going to be fishing from a panga or your own trailer boat. Both Puerto San Carlos and Lopez Mateos have paved launch ramps, which appear to have been designed by a committee, but are usable … with care. The Puerto San Carlos ramp is located on the southeast side of town (24°47’4.73″N / 112° 5’34.65″W). While it is cement, at low tide it only extends a few feet into the water. 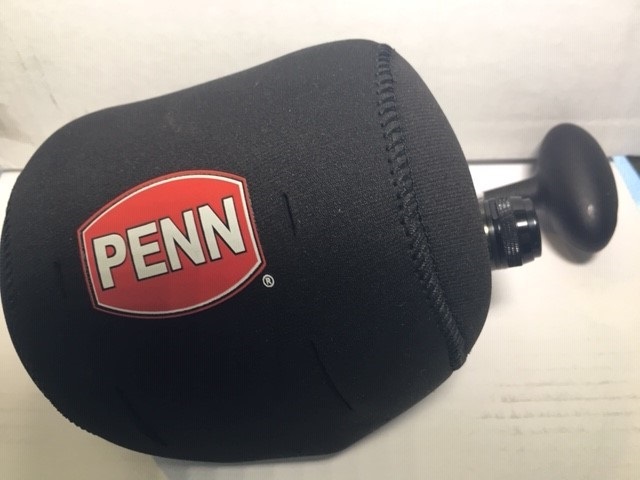 Tackle is “anglers’ choice” with everything from fly and spinning rods to conventional. One common dominator is fluorocarbon leader as heavy as the angler dares. 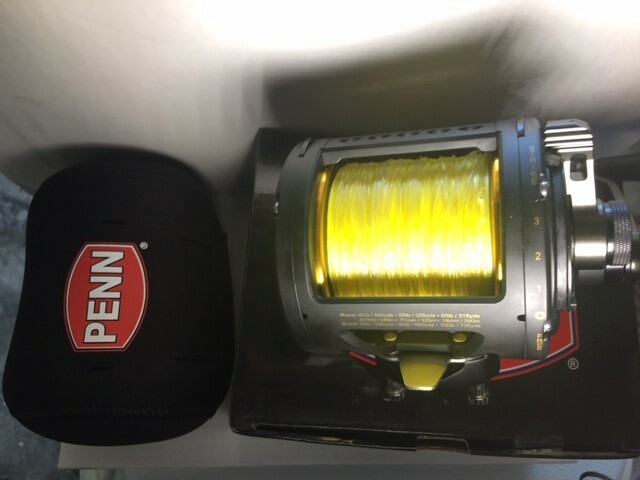 Fly-fishers, use 6-feet of 20-pound for IGFA records with a 40-pound 12-inch bite tippet. 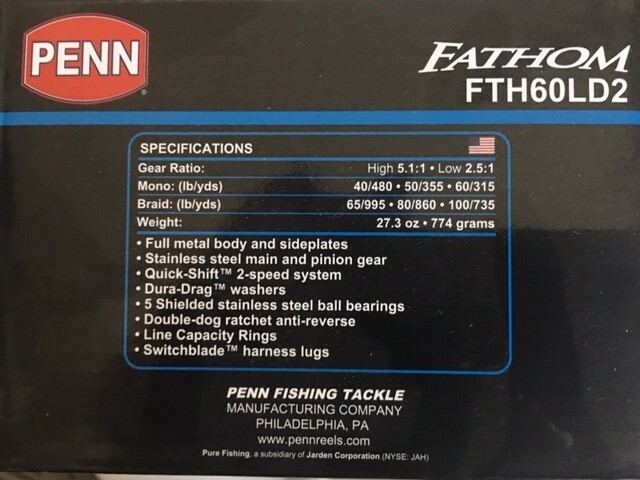 All other tackle: straight 40-pound 4 to 6-feet long. 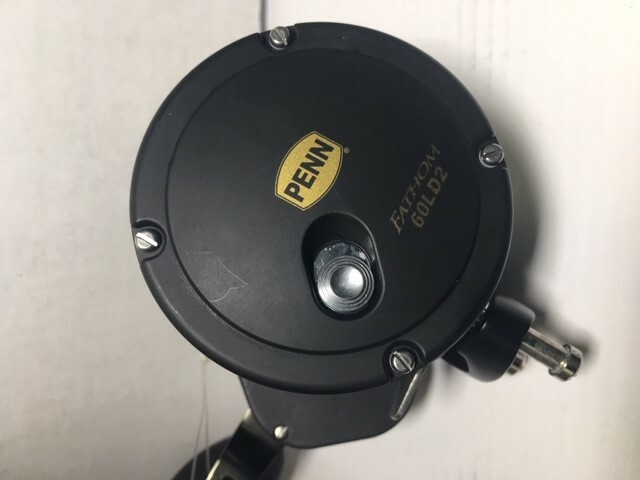 Finally, for all tackle, make sure that hooks on flies, lures and with bait are, at the very least, heavy wire or forged. 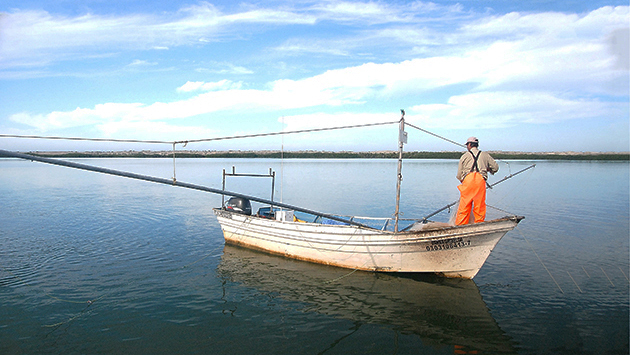 Usually there are live sardines that can be bought or caught either with a throw net along the shore or mangroves, or mackerel with Lucky Joe or Sabiki rigs. 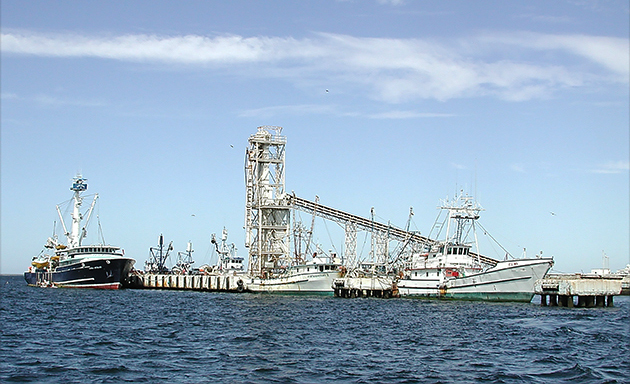 In the fall, during shrimp season, there may be commercial fishermen who will sell you a scoop. The live shrimp are by far the best bait we have found. 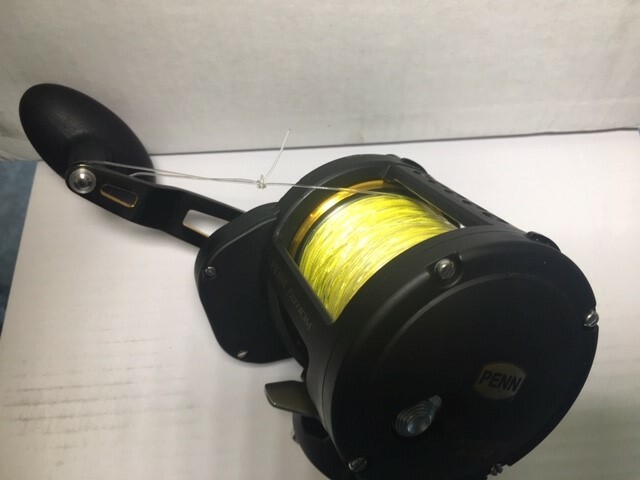 If fishing live bait, use leader set up with an egg sinker heavy enough to keep bait near the bottom regardless of tidal current, with a non-offset circle bait hook 3 to 6/0 depending on size of bait. 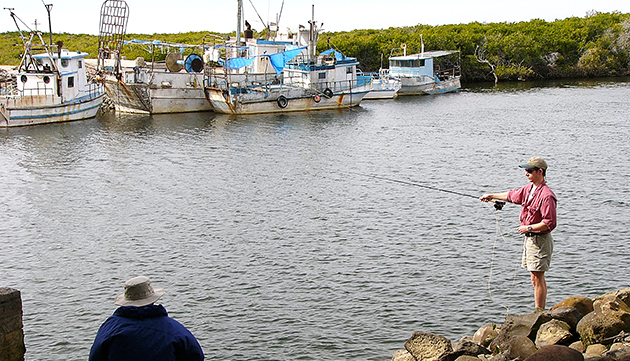 Techniques vary from the trolling with swimming lures to find the spots holding fish or use of a meter and side-scanner. Some have even used a portable, battery-operated one attached to a panga gunwale effectively. For what it’s worth, bass boats are my personal favorite for fishing the mangroves. Working the banks with the boat while two anglers pick their shots in an isolated estero with topwater plugs is some of the best fishing that Baja has to offer. However, don’t overlook the deeper parts of the channels; the fish all feed there at some point or another. Slow-retrieved, swim bait can dredge up some toads! 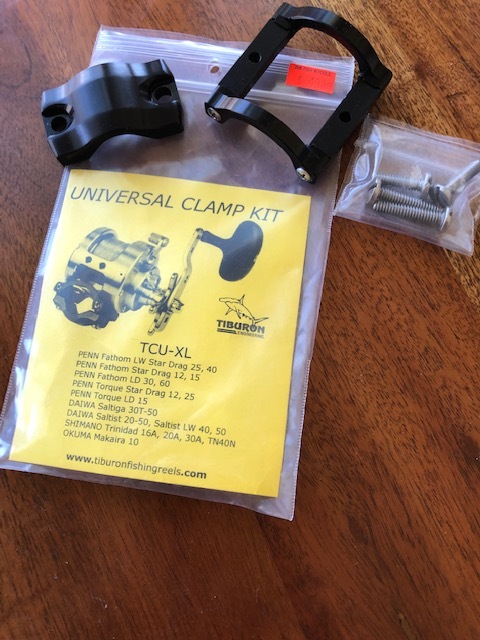 If you can’t wait to get started, go to the bridge at the entrance to town early morning or late afternoon and try a small chrome jig or swim baits retrieved along the rocky bottom under the bridge. 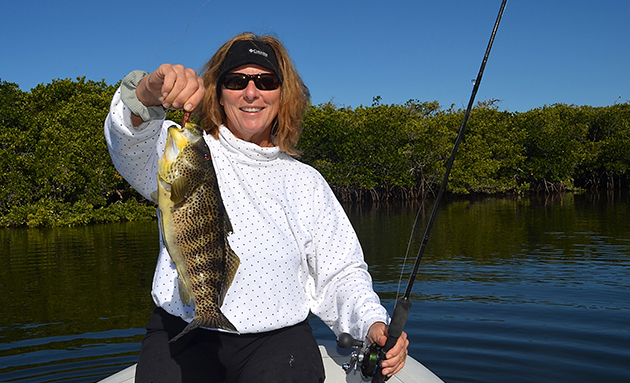 If you don’t get hung up in the rocks you may catch a snook, corvina, pargo, pompano or spotted bay bass. 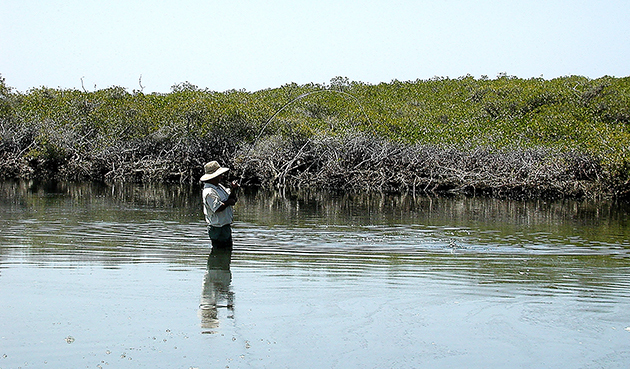 From the pangas, you will find that it is just a short ride from town either to the north or to the south to find yourself in mangrove-lined esteros with few, if any, others fishing them. You feel as though you are in a river as the current moves swiftly through. A word of caution regarding the esteros: for the first-timer, the mangrove-lined channels can be confusing, even with a GPS. Hiring a local guide for a day or two is worthwhile. As is true anywhere, local knowledge is important to the success of your trip. To the north, up a winding channel, midway toward Lopez Mateos, is the well-known Devil’s Curve. That has been at the heart of many fish stories over the years and still remains so. Santa Maria Bay looks deceptively close to Puerto San Carlos when you look at the map. However, the problem is that in order to get to it you have to go out the entrada and around to the entrance to the north. 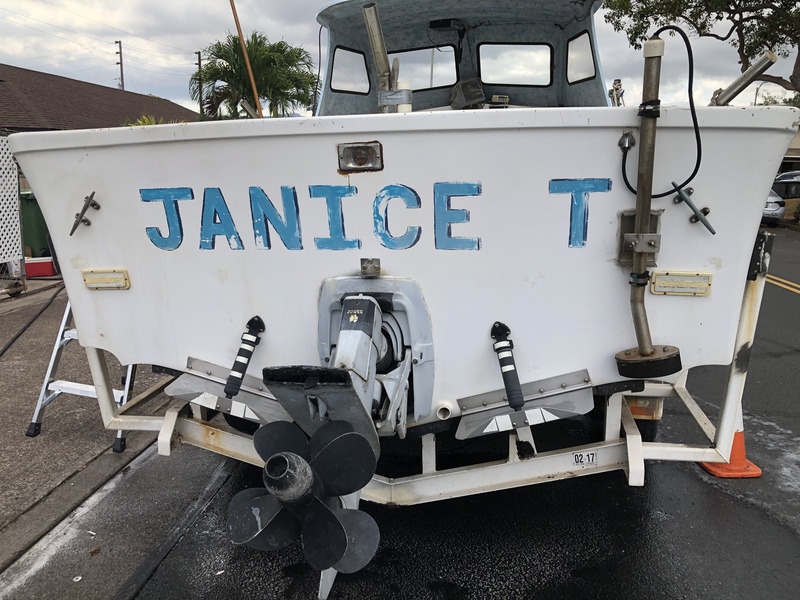 The other option is to go by panga from Puerto San Carlos, hire someone to load the panga on a trailer at Puerto Magdalena, drive the panga over the sand dune a half-mile, and launch the panga in the Santa Maria Bay, saving several hours. This bay is popular with the yachts as well as with the trailer boats as it offers anchorage when fishing Thetis Bank and other areas offshore. 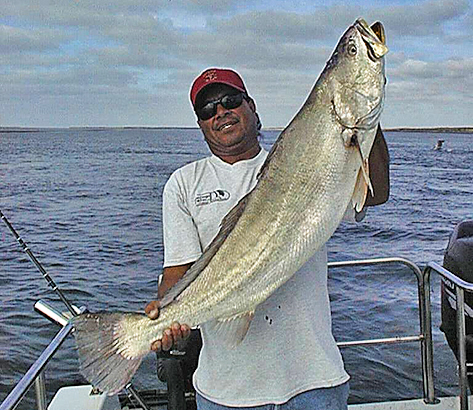 In the summer and fall, the bay is usually loaded with green mackerel, popular bait used for fishing for larger fish offshore. Cabo San Lazaro and Punta Hughes are on the west side and form the protective barrier for the anchorage. 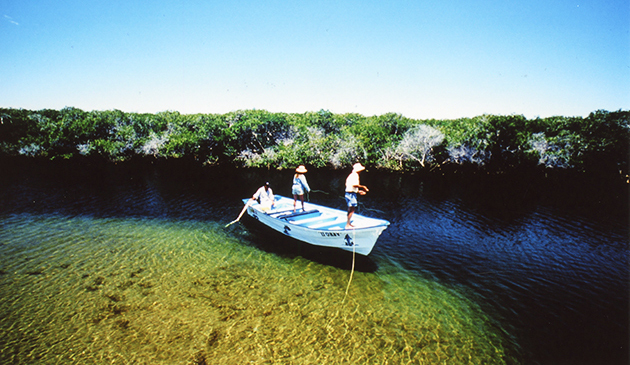 This bay also contains its own small estero, “Santa Maria Lagoon.” The rock structure along the west side of the bay can be very productive for grouper, spotted bay bass, pargo and corvina. Over at the sand beach, you can find halibut, sierra, jacks, pompano and even a few small roosterfish. I have also caught several bonefish in this bay, but they are small and usually found in deep water. 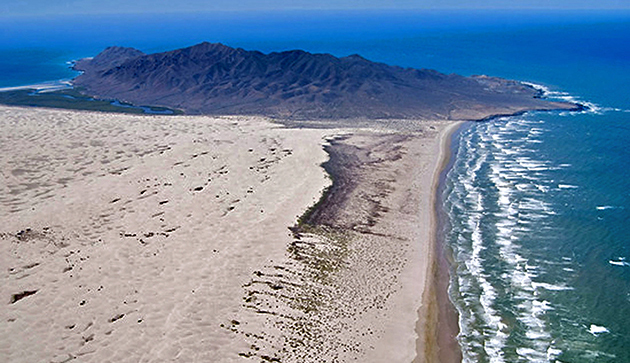 On the weather side of the barrier island is a 30-mile beach stretching to Boca de Soledad. In the other direction is rocky shoreline extending to the tip of the island offering some remarkable surf fishing that can be accessed from Lopez Mateos via ferry. Out in the six-mile-wide entrance to the bay, watch for pelicans and frigates crashing into bait balls. Underneath these you may find yellowtail, bonito, black skipjack, white seabass or barracuda chasing the bait to the surface. A few miles farther out along the 100-fathom curve is where the dorado, tuna, wahoo and marlin are usually found in the summer and fall. If you are in an exploring mood, a 17-mile dirt road, whose condition varies depending on the amount of recent rain, can be accessed approximately 40-miles south of Ciudad Constitución on the right. 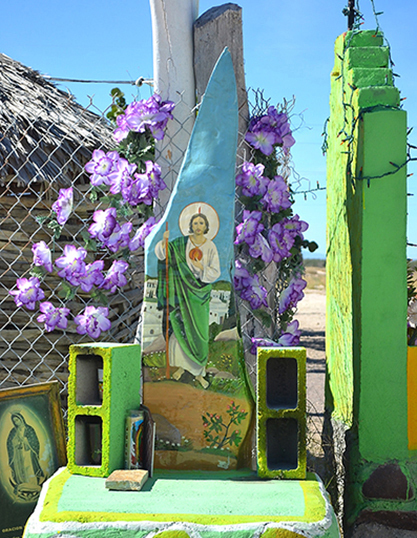 Look for a palapa-covered wooden shack with a prominent religious monument in front at the turnoff. It will take you to Puerto Cancun, a small fishing village located at the northern edge of Almejas Bay. Here, you can hire a pangero to take you to the esteros close by. 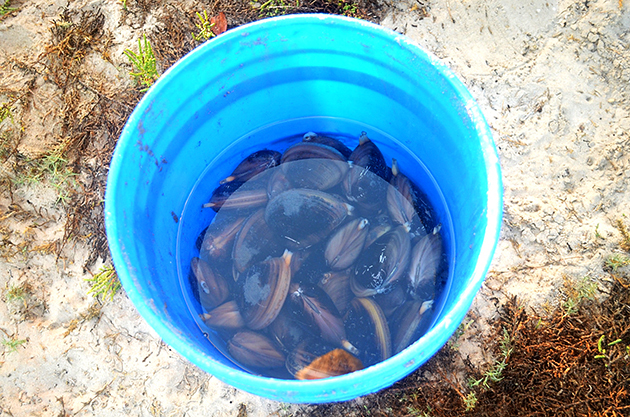 From there, you have access to several more nearby esteros: Estero Salinas, Isla Mangrove, Estero Las Balizas and Las Gallinitas; or check some of the many clam beds found throughout the bay. Farther to the west is Isla Creciente, the southernmost barrier island protecting Alemejas Bay. It contains two esteros: El Muerto and Flor de Malva. El Muerto is near the northern tip of the island and it is difficult to find the channel to enter. Tide is a factor here – you will not be able to enter at low tide. Once you are in the estero, the channel immediately deepens on the right side. As you cruise along the mangroves you can look down beneath the roots and spot a variety of fish looking for an easy meal. 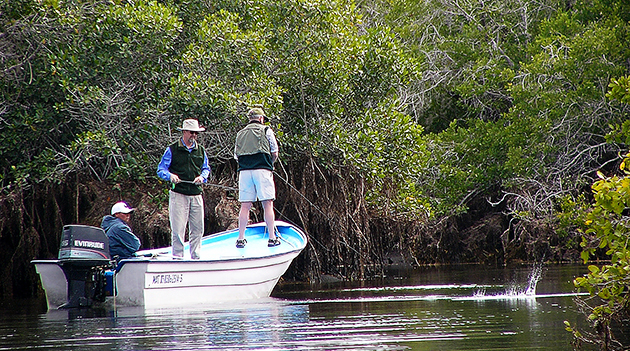 After you locate the fish, either anchor the boat or pull it up onto the sandbar that forms the opposite bank and cast toward the mangroves. This channel is one of the few where we have encountered serious clouds of no-see’ums in June. Both of these esteros contain some quality fish, broomtail grouper, pargo, pompano and snook. To reach Lopez Mateos, travel north on Mexico 1, thru Ciudad Insurgentes. Just outside of town of the left is a signed paved road (filled with pot-holes), which extends 25-miles west to the town of Lopez Mateos. While similar in size to Puerto San Carlos, it lacks many of the services, offering only a few small hotels and some private rooms for rent along with a few restaurants and markets. As in San Carlos during late December-March, the principal activity is whale watching. 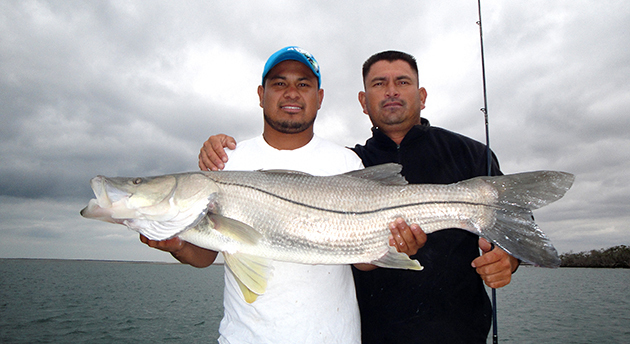 The pangeros offer fishing both in the esteros as well as out in the Pacific. Boca de Soledad allows easy access to the Pacific. 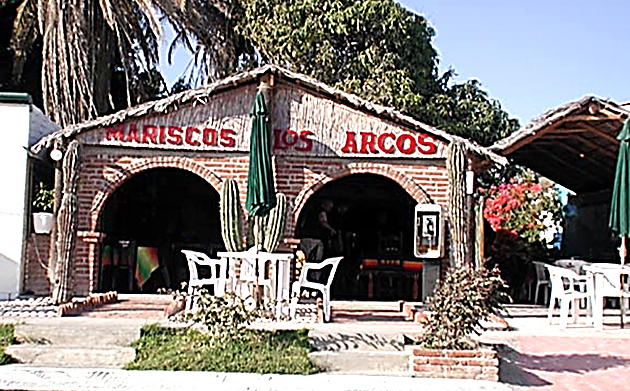 Traveling south in the esteros is Curva de Diablo, the popular spot mentioned previously. Like San Carlos, there are pangas that are available for hire. If you want to explore some of the other areas, Boca de Santo Domingo 20-miles to the north, is a local favorite. Both sides of the bocas offer great halibut and corvina fishing; and on the east side of the main channel you will find some very productive mangroves. The channel along the mangroves is about 20-feet deep with lots of roots. Snook, grouper, pargo, snapper, corvina and pompano all hang out here when the current sweeps against the mangroves. Add a little wind and the mullet and sardine are pinned against the mangroves and are an easy target for any predator. When all of the conditions are right, this can be some of the most exciting fishing in Mag Bay. A lure or fly cast close to the mangroves and allowed to sweep back down and out into the current can hardly be resisted. Bring lots of both flies and lures because some of them will be lost if the bite is on. Over the years, we have fished the esteros every month of the year and found reasonably good fishing regardless of the season. 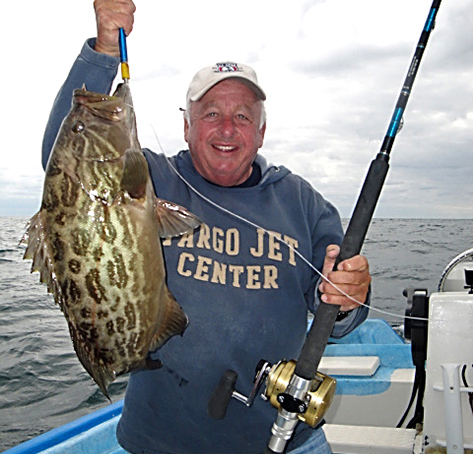 From May forward, the fishing both offshore and in the esteros continues to improve. The peak period offshore is mid-October through mid-November and the inshore and esteros seem to follow the same pattern. Fishing the bay and esteros is as addictive as it is challenging. The vast area holds many secrets still to be unraveled …some may never be discovered if greed and overfishing is left unchecked. 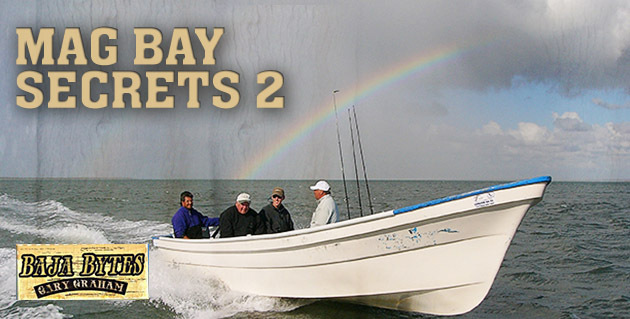 The third and final part to the Mag Bay story will offer a glimpse of the offshore fishery discovered by sport fishers and anglers from around the world in the fall. The expansive bay itself offers more fishing along the shore than in the middle where the whales frolic from late December to March.